The Literary Gothamite: Monday Mailbox: 2nd March Giveaway! Monday Mailbox is hosted this month by Anna at Diary of an Eccentric. Two ARCs, and one to giveaway! Every fall, the men of Loyalty Island sail from the Olympic Peninsula up to the Bering Sea to spend the winter catching king crab. Their dangerous occupation keeps food on the table but constantly threatens to leave empty seats around it. To Cal, Alaska remains as mythical and mysterious as Treasure Island, and the stories his father returns with are as mesmerizing as those he once invented about Captain Flint before he turned pirate. But while Cal is too young to accompany his father, he is old enough to know that everything depends on the fate of those few boats thousands of miles to the north. He is also old enough to feel the tension between his parents over whether he will follow in his father's footsteps. And old enough to wonder about his mother's relationship with John Gaunt, owner of the fleet. Then Gaunt dies suddenly, leaving the business in the hands of his son, who seems intent on selling away the fishermen's livelihood. Soon Cal stumbles on evidence that his father may have taken extreme measures to salvage their way of life. As winter comes on, his suspicions deepening and his moral compass shattered, he is forced to make a terrible choice. Got this one through LibraryThing's Early Reviewers program. It's due out April 12th from Riverhead Hardcover. When newly appointed Deputy Marshal Archie Lean is called in to investigate a prostitute's murder in Portland, Maine, he's surprised to find the body laid out like a pentagram and pinned to the earth with a pitchfork. He's even more surprised to learn that this death by "sticking" is a traditional method of killing a witch. Baffled by the ritualized murder scene, Lean secretly enlists the help of historian Helen Prescott and brilliant criminalist Perceval Grey. Distrusted by officials because of his mixed Abenaki Indian ancestry, Grey is even more notorious for combining modern investigative techniques with an almost eerie perceptiveness. Although skeptical of each other's methods, together the detectives pursue the killer's trail through postmortems and opium dens, into the spiritualist societies and lunatic asylums of gothic New England. Before the killer closes in on his final victim, Lean and Grey must decipher the secret pattern to these murders--a pattern hidden within the dark history of the Salem witch trials. This was an unsolicited ARC from Random House. Love love love the cover. The book comes out tomorrow (3/27). I'll post the review next week. 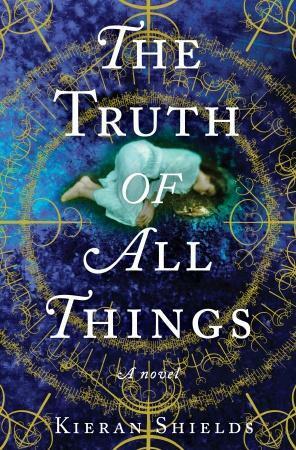 The Literary Gothamite and Random House are giving away a copy of Kieran Shields' The Truth of All Things. Fill in the contest form to be entered. The contest is open to US residents until 11:59PM on Saturday March 31st. You may only enter one time, but you can get an extra entry by linking the giveaway on Twitter (just make sure you mention @lalalalaurs)! The title of the first book has me curious about it! These both look good! Happy reading!